This recipe is inspired by Apple straddle. These rolls are simple to make and absolutely delicious on its own. Apple is used as a based filling and seasoned with Cinnamon and Nutmeg. 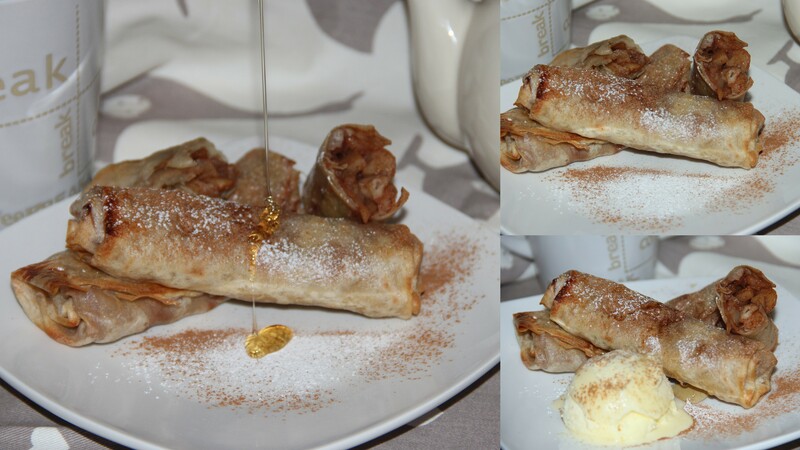 Homemade Spring rolls are used and Maple syrup is used as sweetener, which can be personalised. These are baked not fried. Pre-heat the oven at 180deg c. Line a baking tray with baking sheet grease and set aside. In a bowl, toss the apple with the apple, honey, cinnamon, nutmeg, lemon juice until blends together and set aside. Fill each wrapper with about two tablespoons of the filling wrap and seal using the plain flour paste. Arrange on the prepared baking sheet and bake, brush with the butter/spread and bake for 18-20minutes or until golden brown. Some of the juices will seep out but not to worry. Serve then with Sprinkle some sugar and serve with honey or a dollop of ice-cream. 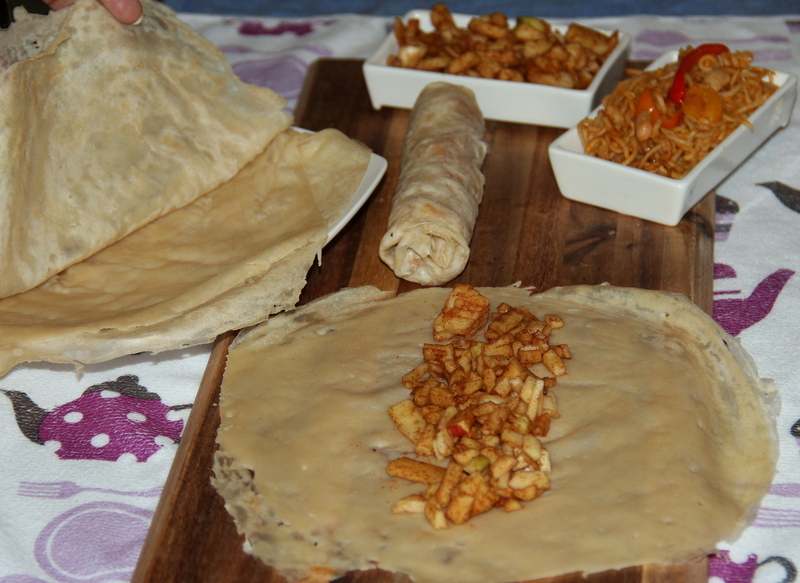 I used homemade spring roll/filo sheets alternatively store bought can be used. Spices and sweet can be personalised as per the taste. Posted on November 6, 2014, in Appetizers, Dessert, Indian, International, Kids recipes, Starters. Bookmark the permalink. 27 Comments. Love this dessert, and you make your own wraps, Looked at the recipe and it looks pretty easy to make. Served warm with some ice cream, delicious. Yummy, my favorite sweet recipe! I do it very often at home :)! What a great combination of ingredients, borrowing from all kinds of cultures, and then healthy, to top it all off. Awesome! Love Love this Chitra!!! Great fall treat!!! 🙂 YUM!!! I really love the look of these!